Another 2 ATR's has just arrived to accommodate the demand of big equipment to our increasing passenger. The Let L-410 Turbolet is a twin-engine short-range transport aircraft, manufactured by the Czech aircraft manufacturer LET, mostly used for our scheduled flight. Another 2 brand new Csesna Grand Caravan with a state of the art Garmin G1000 Glass Cockpit has just arrived to accommodate our increasing passenger demand, along with our Eurocopter AS 350 B2 helicopter. The Cessna 208B Grand Caravan is a reliable, strong, powerful and an accommodating workhorse in every way. With many configurations in the cabin, the Grand Caravan can be outfitted with seats or cargo holds. The standard high-density airline configuration features four rows of 1-2 seating behind the two seats in the cockpit. This variant is capable of holding up to thirteen passengers. It also features an under-belly cargo pod, which can be used for additional freight capacity, or for passenger baggage. Used for almost anything and guaranteed to exceed your expectations. Our latest addition, 5H-YES and 5H-NOW features a state of the art Garmin G1000 glass cockpit suite. The Eurocopter AS350 Ecureuil ("Squirrel") is a single-engined light helicopter originally manufactured by Aérospatiale (now part of Eurocopter Group). 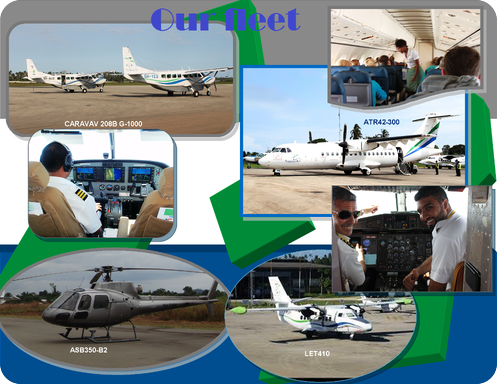 Specifications: 1 pilot, 5 passengers. The Piper PA-28 Cherokee is a light aircraft that were designed for flight training, air taxi and personal use and are built by Piper Aircraft. All members of the PA-28 family are all-metal, four-seat, single-engine piston-powered airplanes with low-mounted wings and tricycle landing gear. The PA-28 aircraft have a single door on the co-pilot side. Specifications: 1 pilot, 3 passengers; propeller; single-engine, piston powered; max speed 140 MPH. Registration: 5H-TFS; 5H-TFD. The Piper PA-34 Seneca is a light multi-engine aircraft, and used for personal transport, bush flying and comfortable private charters. The 2 turbo powered, six cylinder TSIO-360 Continental engines, provide improved performance.